Here are some new sets for 2011 in Europe. 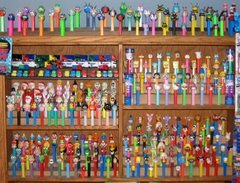 Mr. Men Pez are based on a series of children's books by Roger Hargreaves started in 1971. Each character has a dominating trait and a look which exemplifies that trait. There is a possibility of many characters in this series based on Hargreaves 48 "MR. MEN" Characters and 42 "LITTLE MISS" characters including Mr Happy, Mr Silly, Mr Jelly, Mr Snow, Mr Bounce, Mr Forgetful, Mr Funny, Mr Bump, Mr Tickle, Mr Small, Mr Messy, Mr Greedy, Mr Sneeze, Mr Strong, Mr Daydream, Mr Fussy, Mr Worry, Mr Uppity, Mr Dizzy, Mr Topsy Turvy, Mr Muddle, Mr Mean, Mr Nosey, Mr Chatterbox, Mr Noisy, Mr Impossible, Mr Lazy and Mr Grumpy. There have been several animated film and t.v. series made with the characters in the UK and US. The characters even have their own web site - mrmen.com And of course - we can't get enough at that HELLO KITTY.